Announcing A New Midterm Missions Initiative! Midterm sounds like I’m talking about a political election topic, doesn’t it! Not true! This last week at the Pepperdine Bible Lectures, Let’s Start Talking and Missions Resource Network announced a new initiative for carrying the message of Jesus to the world more effectively. With this initiative, we believe we can help make better use of time, resources, and people when sending Americans overseas on the mission of God. Let’s start with the most common current approach to new missions: Most of our missionaries first participate in some kind of short-term mission. Many of these trips are either compassion missions—medical, disaster relief, construction, poverty-related, or children/orphans—or they are “survey” trips to better understand what needs to be done to prepare for a long-term mission. A few short-term missions could be categorized as evangelistic, though all of them are intended to share the love of Jesus. Usually young couples, some young single professionals, or an occasional family then makes the commitment to long-term missions. By this, we usually mean a complete move to a foreign location for five years or more. You sell your house and your car and move to a foreign place, spend probably two years learning the language and acclimating to the new culture, perhaps working with an established congregation or, if not, laying the groundwork for establishing a new congregation—mostly “house churches” today. The sponsoring church is willing to invest a huge amount of money to move these new workers and spend two years preparing them because they expect to get at least three more years—maybe longer—of excellent service from them. Most Americans stay on average just over 3 years on their mission site—regardless of what their commitment was. In three years time with two spent primarily in preparation, it is very difficult to accomplish any of the initial long-term goals. Planting self-sustaining churches with national leaders which survive the departure of the American missionary in essentially one year is really a completely unrealistic goal. The supporters and sending churches look at their investment in this failed effort and feel as if they have been burned, making them less interested in ever doing something similar again. Instead of simply wringing our hands and bemoaning the current situation, MRN and LST sat down to pray and talk, asking God for wisdom to see a new path. Why these two ministries? Missions Resource Network was begun to help churches send missionaries and to help care for them better while on the field. Because of that mandate, potential missionaries began coming to them for training which they then received from highly competent missions experts. In recent years, MRN has begun focusing also on training foreign churches to be sending churches and not just receiving churches. Let’s Start Talking has always been focused on sending short-term workers (2-6 weeks) on evangelistic missions. We also send a few interns each year on 6-12 month missions, usually following up an LST project. So, after months of prayerful conversation and much collaboration between our two ministries, we would like to offer our churches and potential workers a new strategy– our Midterm Missions Initiative– that we believe will be better for the workers, better for the sending churches, better for the global church being served, therefore better for the Kingdom! Planning to stay for 2-3 years. If this is how long people will stay, then let’s not pretend that they will stay longer; rather, let’s plan a work with goals that are reachable in this midterm timeframe. Planning to avoid many of the upfront expenses of a long-term work, such as moving whole households, investing heavily in language study, start-up costs for new church plants (including buildings), etc. Focused training for midterm work, not overtraining them for tasks they will not be there to do. Working in English, taking advantage of the world-wide interest in English in both industrialized and developing countries allows workers to go where they are called and to begin working effectively the day after they arrive. Through specific training in making disciples, they will be able to expand the vision and presence of the global church, working for multiplying growth, but not creating dependency on their presence. 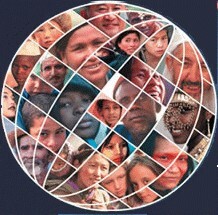 A global church requests help and is willing to invite a midterm missionary or couple. Potential workers are identified or identify themselves and contact MRN or LST. Workers make application and do some preliminary testing to determine readiness. Workers then commit to an LST project, probably to the site where they will eventually be going. In conjunction with their project, they receive complete training in the LST approach. After successfully completing their LST project, they are coached by MRN through specific tasks including finding a sponsoring church as well as preparing themselves to implement a disciple-making This period may take 3-6 months. First, they will follow up with people contacted through LST and will continue reading the Gospel story with them while helping them with their English. While doing this, they will begin looking among their Readers for those people who are seeking faith AND who are willing to share what they are finding with other people in their network. When they identify such a person, they approach them about beginning a Discovery Bible study—a very simple and intuitive approach to finding Jesus—in their home or at work. One of the big differences is that it is not the American worker who leads this, but the person at the center of this network. He/She shares just as much as they have learned the week before from the American worker. As they share with their friends, this first Person is also encouraged to look for seekers among them who will begin a new group in their home. That second person shares what they have learned from Person #1—and so it grows and multiplies. As people become believers, then Christians, they are either integrated into the local congregation or they collect themselves into new churches. Either way, the Lord has added to those who are being saved! And when the American leaves in 2-3 years, the work has far outgrown him/her and is not dependent on their efforts to continue. And our sending churches in the States will love this. They will have shorter commitments with more reachable, tangible goals which can be achieved at much less expense. They can send their own members to do LST, thus helping their midterm worker. They will have the cooperation and partnership with MRN and with LST to walk beside them. What is there not to like about this!! And some of these midtermers will become long-termers—and some lifers! But the process of making these major decisions for both the workers and their sending churches will be much more tested and proven before those kinds of commitments to each other are made. And that’s good too. Let’s get started! What global church wants to invite a midterm person or couple? Who wants to go for 2-3 years? The harvest is ripe! Contact MRN or LST and we will be glad to help you get started. Do you need to spend ten hours on learning Chinese if you are going to go to China for a two-week missions project? Do you need to spend five sessions learning about Communism for your mission trip to Albania? If you are the missions ministry leader at your church or the youth minister in charge of the teen mission trip, and you believe that everyone who goes on a short-term mission should go equipped—which I hope and pray you do–, how do you determine the best way to equip those workers going out from your church. Let’s look in the next few posts at some suggestions about the content of training for short-term mission teams. Everyone who goes on a short-term mission needs to be prepared spiritually! Just like you get vaccinations and take vitamins before the trip, you need to help your workers bolster their spiritual health before they go. They need prophylactic preparation to prevent spiritual sickness, they need instruction on managing their spiritual health while they are there, and then they need to know what to do if they get sick. Talk about motivations for going—and be honest because most people have multiple motivations, including adventure, travel, self-improvement, improvement of personal skills, and—of yes, helping someone else to know Jesus! Preparation should include acknowledgement of these motivations along with a healthy way to prioritize them. Acknowledging the lesser motivations helps remove any guilt or shame workers might otherwise carry with them. Good preparation will help them know ways to focus their motivations so that their activities will be both appropriate and effective for reaching their higher goals! Talk about the spiritual goals for this trip. It is not enough to just hope that somehow conducting a VBS will make an impact for Christ. How will you know if you have made a difference or not? Do you have short-term and/or long-term goals? Are you planting seeds or harvesting because of what others have done before you? What spiritual challenges might workers meet? Most short-term mission projects are mountain-top experiences for the workers, but in every mission situation, there are also inherent possibilities for spiritual challenges. If your workers are prepared for those challenges, they are more likely to overcome them effectively. For instance, sometimes workers are confronted by “differentness” at the mission site: different doctrines, different rites, different styles of worship–and it shakes up their spiritual world for a while. Other workers are challenged when they try to verbalize their own faith and fail to do so adequately. Some workers find moral temptations more alluring away from home and are challenged! I’ve often said that being on a mission field is like being in a pressure cooker and any little crack in your spiritual armor may be put under enough pressure to split wide open and leave you very vulnerable. Preparation for such challenges before a worker goes should give him/her an opportunity to check for cracks! What role will praise and prayer play? If you will have daily times together for praise and prayer—and I hope you will—then you will need to prepare for those times before you go! Nothing is more discouraging than haphazardly prepared devotionals with half-baked thoughts and dashed-off prayer to cap it off. Nothing is more encouraging than good time with God and your fellow workers, when you are giving thanks, praising Him, listening for His instructions for the day, interceding with Him for those people with whom you are working, and asking Him to work powerfully through you. Putting a spiritually healthy team on the plane, a team prepared for spiritual challenges while on the field, must be one of the highest priorities for your mission preparations. We only have the stamina for harvesting, not for planting and nurturing. We believe we should be able to work everywhere else in the world cheaper than in the U.S.
Our mission work is dependent on how many self-motivated missionaries surface in our fellowship as opposed to a strategic global vision. We are not by nature collaborative. We have been and are still too often negligent in caring for missionaries on the field, but especially when they return. Click here, if you would like to review the comments that went with these points. I suggested at the end of the last post that these particular characteristics would not serve us well going into the near future of foreign missions, so in order to become more effective in carrying the Gospel to the whole world, we are going to have to work differently. In this and the next post, we will explore these two ideas. Americans are less well-liked in the world. After WWII, Americans were welcomed as defenders of liberty. Even into the 60s (our second big wave of mission efforts), Americans were relatively popular because we had defended the world against Communism. That glow was slightly tarnished by Vietnam, but re-polished in most parts of the world through the Reagan era and the collapse of the Soviet Union (another big Mission Wave). Most of that global popularity has been lost. Look at this map, charting those who have a favorable view toward the U.S.
What you see in dark blue are those countries who like us. Even the other bluish countries have fewer than 50% positive responses. My point is not about U.S. politics and its participation in the global community, rather that being an American abroad is, at best, no great advantage and, at worst, can be outright dangerous—none of which is really good for the future of foreign missions from the U.S.. The world is now urban and becoming increasingly more so! In 1900 there were only 12 cities of 1 million population or more, but these 12 became 400 by the year 2000. You probably aren’t surprised that Singapore is 89% urban, but Congo is 41%–that’s surprising! Forty cities in the world boast populations of 5 million plus—and 80% of those are in poor countries, so it is not just the industrialized world where the flight to cities is dramatically changing the landscape. We Americans have had good rural churches, and now we have good suburban churches, but urban churches are a challenge we have not yet figured out at home, much less abroad. Global urbanization is making missions more challenging for us. o There are no cheap places in the world to go!! The most expensive city for expatriates in the world is Luanda, Angola—did you expect that? Number four is N’Djamena in Chad. New York City is #32 and the only U.S. city in the top 50! o If poorer countries (like African countries) are getting more urban and wealthier, then they are going to be less and less impressed by our humanitarian approach to foreign missions. To summarize, globally speaking, the people that US–sent missionaries would want to approach view Americans less favorably, they are typically living in very large cities with costs that Americans can hardly afford to live in, and even the poorer places are climbing out of poverty and need our benevolence and services less and less. These are the challenges in foreign missions for churches of Christ in the near future. My dad played the violin–not the fiddle, the violin. He had polio when he was ten, and, fortunately, it didn’t leave him crippled, but he could never really run again, so he couldn’t play sports like the other boys. He chose to play in the orchestra–in the high school orchestra, which was the pride of Glasco, Kansas. When I was eight and in the third grade, my school offered free violin lessons, so, of course, I started getting out of class one or two days a week and taking violin lessons. I used my dad’s violin. By the time I was in the fifth grade, I was the only one who was playing at my level at the Bonnie Brae Elementary School, so my weekly lessons were private lessons–and still free. Because I was pretty good for my age–maybe–my teacher would take me to other schools and we would play short programs together in their assembly, probably trying to get younger children to enroll in the free strings programs at their schools. In the All-City Elementary school orchestra, I sat on the first row with four or five other kids, so I guess I was decent, but the perk I really liked was that because I was in the violin program, each year I was taken out of school one day with the other kids in strings to attend a special concert by the Fort Worth Symphony Orchestra at the Will Rogers Auditorium. I knew nothing about what they played or who the composers were, but I loved the music–the huge blend of all of those different instruments: violins, violas, cellos, bass violins, oboes, bassoons–even the triangle and tympani. How could all of those different people–maybe 40-50 players–with so many different gifts and playing so many different instruments at the same time produce a result that was so beautiful? The word symphony comes to English from two Greek words: sun, which means “together,” and phone, which means “sound.” The word is usually translated harmony, harmonious, or harmoniously, when talking about music, but is also commonly used to mean to agree, to be of one mind, or to connect the most literal meaning with the vernacular: to be in unison. About five years ago, we started attending the National Missionary Convention of the Independent Christian Church/Church of Christ. Having been involved with foreign missions our whole life together, Sherrylee and I have been to many, many missions conferences and mission workshops in our branch of the Restoration Movement–and because of our direct involvement we know lots and lots of the people involved. But just across the aisle at the NMC the first time, our most common feeling was: we don’t know anybody here! That was five or six years ago. Last week we attended the International Conference on Missions (ICOM), which is the new name of the NMC. 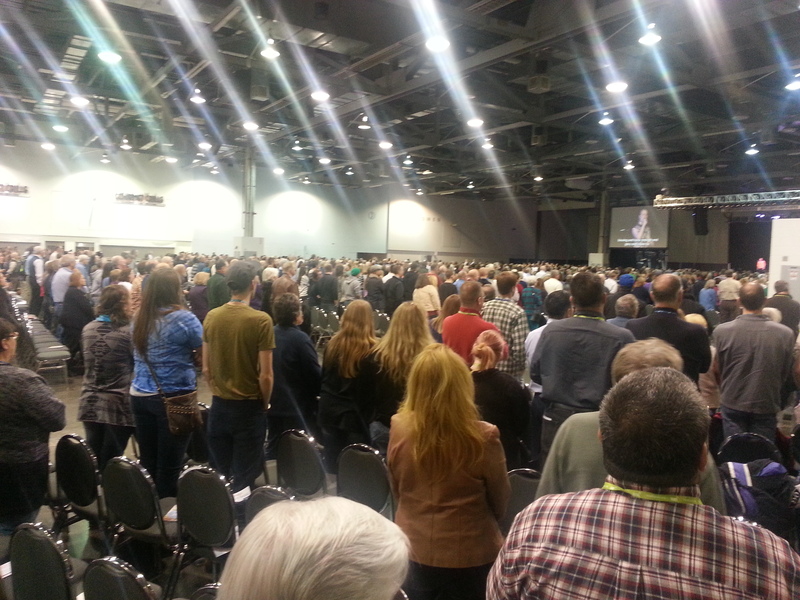 Over 10,000 people attended the 2-3 day event, held in the Convention Center in Columbus, OH–one of the largest single venues I’ve ever been in. One huge section of the convention center was set aside for “exhibitors,” which at most conventions means businesses which are trying to sell you something, either immediately or after you get home. At ICOM it was different. Picture an area the size of your nearest Super Wal-Mart or Super Target–not just your neighborhood sized–and then fill that whole area with small booths, each one representing a mission effort of some kind. There were individual missionaries, like Pino Neglia, missionary to Lecce, Italy and to Albania. We met him three years ago at his booth and in 2014, LST sent him a team to be a part of his efforts. Eric Estrada (not the movie star), missionary to Murcia, Spain, was there. We sent him three teams in 2014. There were also plenty of mission organizations like us: Pioneer Bible Translators, Open Door Libraries, Holy Land Christian Foundation–and other businesses and organizations that support missions: transportation, security, training ministries, even fund raising ministries. It was a symphony! So much diversity of talent and interest. Long-term, short-term, house church, mega-church, men and women, social justice and evangelism, academic and common, all these different instruments but all playing their part in the same symphony: the Missio Dei — the Mission of God! I came home wondering why we in Churches of Christ have so much trouble playing together? Many have already spoken to this question, but one part of the answer is that we are rapidly losing our sense of together. We know the music, we know the director, but too many of us do “what is right in our own eyes,” a phrase from Judges 21:25 that introduces some of the darkest days for God’s chosen people Israel. Our papers first created a sense of together, but we are down to one, the Christian Chronicle, and it struggles to survive. Then our lectureships held us together–but they are a shadow of what they used to be–perhaps with the exception of Pepperdine Bible Lectures. Even our song books used to keep us together, but we don’t all sing the same songs anymore! Our symphony is not in harmony. We try to have a Global Missions Conference every three years–and we hope to have 1000 people attend. The World Missions Workshop for college students is barely hanging on to life. There are lots of small, independent gatherings for missions, nice little quartets, but where is the symphonic chorus? After the fifth grade, I changed schools. I started attending Fort Worth Christian School, which offered no free violin lessons–so I quit playing the violin. Two years later, when FWC started a band program, I took up the trombone and played through college. My brother Gary was three years behind me in school, but that was not a big gap at FWC in those years. He and I were the whole trombone section of the band for 4-5 years. We didn’t march–we were too few; we did well just to have enough of the required instruments to play at all. We as a fellowship have been satisfied too long with being a small non-marching band. Jesus said he wanted a symphony. We dare not forget how to play in harmony together. The two panel members in this second session had not heard the great debate of the first session. These two ministers had at least forty years of youth ministry between them; in other words, they weren’t fresh-out-of-college youth ministers. These two guys have between them literally hundreds of kids in their programs. These guys both do at least one youth mission trip each year personally, and they help organize others for their students. How do they feel about short-term missions? Buster just told his story, how he was a young man with a quite predictable, successful future, then he participated in a short-term mission and it changed his life. He left the safe lane and became a youth minister, so he could help young people find what he found. One of the main ways he does this is to make sure they all have short-term mission experiences–like he did! These guys had not read those academic studies that said short-term missions have no impact on those who participate. They have years of experience and lives of hundreds of their young people who contradict the conclusions of those studies. They did acknowledge, however, that without proper planning and preparation, that a lot can go wrong. There is, however, no need for every church to re-invent the wheel. Many resources exist to help you evaluate your church’s teen mission program. (MW: Start with “Standards of Excellence for Short-Term Missions” www.soe.org ). This third panel began by confessing confusion over the topic that I had given them. What is a “hard” place? Were we talking about unreceptive places, about inaccessible places, or perhaps unsafe places. As they talked about unreceptive and inaccessible places, their message seemed clear: sometimes short-term missions are the only productive way to work in these places. I can tell you that LST was created for the unreceptive people of Germany and Western Europe, and over three decades later, what created opportunities in Germany has created the same kinds of opportunities all over the world. World English Institute is also penetrating places previously considered inaccessible. What really captured the conversation in this session was the question of those places in the world that might be considered unsafe! Benny Baker has worked in Nicaragua for many years, and one of his main strategies has been to bring short-term teams in–lots of them–and to send them all over the country, including some places where they went with armed guards. Our American obsession with safety (see the whole Ebola-in-America drama going on right now!) was referenced more than once. Benny argued strongly and well that safety is a solvable problem with good information. He argued that most churches, schools, and volunteers make their decisions about whether it is safe to go to Mexico or Africa or anywhere based on what they see in television. Pick up the phone and call the local missionary or your most trusted person at the site you are considering. If you thought that short-term missions were only for teens or college students, then these two panel members were prepared to change your thinking. Leslee described the great shift that Let’s Start Talking has experienced in the last few years. Once almost exclusively a college student/ summer short-term mission ministry, now LST finds itself recruiting, equipping, and sending twice as many adult church members as college students. Retired, almost retired, long retired, families on vacation, homeschoolers, teachers off in the summer–the demographic is huge of those church members who have always wanted to do mission work, but they didn’t have a vehicle. Now there are many opportunities. Chris mentioned many of the activities of their church members that perhaps earlier wouldn’t even have been called a short-term mission. He emphasized how important these were to the local church’s outreach, both at home and abroad. Short-term missions are not going away any time soon–nor should we want them to. There is no excuse for doing a poor short-term mission project. There are enough resources to guide you and enough people who do them right. Use them. Join them. There is a short-term mission experience that every Christian can do! And they will be better for it. And the Kingdom of God will be advanced because they did it. 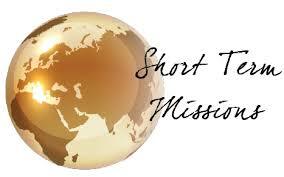 What Do the Experts Say About Short-Term Missions? Every three years, missions leaders among Churches of Christ stage an event called the Global Missions Conference. In size and scope it is a poor cousin to the International Conference On Missions hosted annually by the Independent Christian Churches/Churches of Christ. The smaller scale, in my opinion, is more because of greater resistance to central organizations rather than a lesser commitment to missions in Churches of Christ. A comparison of missions history between the two fellowships, however, would be a great dissertation topic for someone. The Global Missions Conference was held October 16-18 at the Goodman Oaks Church of Christ in Southhaven, Mississippi, a suburb of Memphis, Tennessee. I have not heard an official number of attendees yet, but I would guess it might be near 1000, although I suspect that many local people did not register. I had the privilege of organizing the Short-Term Missions track for this conference, which consisted of four separate one-hour classes conducted over two days. My concept was to develop a practical topic for each session, then invite highly experienced workers in those areas to form a panel to discuss each particular topic, first among themselves and then with those who were present. I was quite pleased with the classes, which were all well attended, so I thought I would summarize the content and share it with you as well. Without exception, all of the panel members agreed that the emphasis in short-term missions had shifted in the last two decades from evangelism to humanitarian aid/social justice. Some of them saw this shift more as cultural, while others understood it to be a theological shift. The cultural proponents held that the post-modern shift to tolerance as the highest virtue creates an environment where people are no longer willing to “judge” other people’s views, much less feel the need to “correct” them. One of the panel members, however, argued that the shift from evangelism to social justice activities was nothing to worry about, that, in fact, when we teach a poor farmer how to irrigate that we are participating in God’s plan to save the whole Creation. You’ll recognize this argument perhaps as one that younger preachers typically have juxtaposed against a type of evangelism that was only interested in the soul of a person and not the whole person. I’ve thought a lot about these comments since the conference and will share some of those thoughts with you soon–but they need to ripen a little. short-term missions are not cost-effective ways of doing missions. As I listened to them quote these results as facts, I could no longer keep quiet because not only did these results go against my whole lifetime of experience, but also against some other very good research with which I was familiar, but which was a little older than what they were quoting. I think I can offer a possible explanation for why current research may suggest different results from slightly older studies. First, as the whole panel has confirmed, when we examine short-term missions as a category now, we are only looking at service-oriented experiences. For a whole generation of our fellowship, the word missions refers only to caring for physical or social needs of peoples, not seeking and saving the lost. Painting houses and digging wells, even healing the sick and loving on orphans, while most certainly the purest of Christian ministry, but if absent of the Word, could all be done by good Muslims or good Agnostics. These kinds of activities in and of themselves do not complete the Great Commission. And, if this is true, then why should we expect short-term mission activities that focus on these services to produce the same kinds of impact and results that short-term missions focused on telling the Story of Jesus have had? And that was just the first panel! I’ll finish the report on the other three panels in the next post. I always think of Byron Nelson, the legendary golfer, during this time of year. I met him eight years ago, just weeks before he died. But I’ll finish that story later. Let’s Start Talking is in the middle of our biggest fund raising activity of the year. Once a year–during August and September–we have what we call our Season of Generous Giving. Typically, we conclude this season of fund raising with the September Celebration Dinner, this year on September 25. The activities and emotions of this season are all over the place! 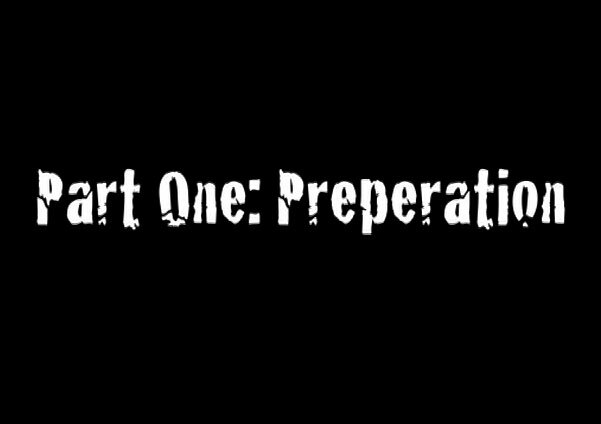 We start with trepidation! Since September 30 is the end of our fiscal year, we need a successful fund raising effort to finish paying for the work that we have already done! The difference between a successful effort and a less successful effort can mean the difference for us of finishing our fiscal year with a positive or negative bank balance! So much is at stake! But we also start with great faith that our God is rich in mercy and His people have all the resources needed for His kingdom to advance. Most years, our prayers and efforts are richly blessed, but other years, the same prayers and often greater efforts do not result in all we thought we needed. In this context, I was thinking about Luke 10 and the report of Jesus sending out the 72 on their short-term mission. “Do not take a purse or bag or sandals . . . ” (v.4). What was he thinking about there–what was he trying to teach them? If LST put a team on a plane to somewhere, but told them not to carry a suitcase and don’t take any money, we’d be considered irresponsible and negligent. If a church required missionaries to go without support, they would be used as a negative illustration at every missions conference for the next decade. So what was Jesus doing? Teaching? But, if the workers had gone out with all they needed, what would those to whom they were going fail to experience or learn? This is what gave me the most pause for thought. They would not have learned that to be asked for help is an opportunity to participate in the plan of God. I’m always a little surprised during this Season of Generous Giving at a few people who are somehow offended when we ask them to participate with us financially. Some of them are perhaps like Ebenezer Scrooge and simply don’t believe in charity because they believe so strongly that they have earned and deserve everything they have! What foolishness! I suspect most, however, just find it awkward, and they don’t like to be put in awkward situations. Either they don’t think money is something you talk about, or they may not be able to say either Yes or No to the request without some embarrassment–and they don’t want to be embarrassed. So should someone not hear the Gospel because you are embarrassed? Or maybe this is a place where God can transform our thinking, to refocus us on others rather than ourselves? They would not have learned that it is more blessed to give than to receive! We only know that Jesus said this because the great missionary Paul told us so. It’s not recorded in the Gospels. Those who received the 72 would not know what God would do for them if they had not offered them food, shelter, maybe money, and sandals! What would God do to bless us if we gave to support those who are going? I can only imagine good things–and He is able to do more than we can imagine. They would not have learned that generosity is at the core of the message proclaimed by those who go! Can you even imagine a person of peace saying, “Well, I totally accept the message from God that you have brought into my home, but I’m not going to give you a bed or share a meal or offer to give you an extra pair of sandals because if I do, I won’t have enough for myself.” Unthinkable! The 72 took nothing with them because they believed that people of peace would offer them all they needed to accomplish their mission. My experience with a lifetime in missions is that some are generous if you ask–but almost no one is offering. Now back to my memory of Byron Nelson. One Sunday in August 2006, I was teaching an adult class at church, talking about LST. After class and after the aisle had cleared, a large elderly man came toward me on his scooter. He introduced himself to me–but I knew who he was. 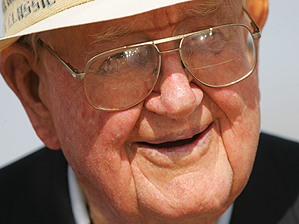 It was one of the greatest golfers of all times Byron Nelson. He immediately asked me a question which I am almost never asked: “How is your ministry doing financially? Is there something I can do to help?” I was literally speechless for a second, managing finally to tell him that we were always in need of support–a pretty lame answer for such a generous question. He invited us to come to his home that week and present our needs more particularly. We met him and his wife Peggy, presented our need, then left them to talk and pray about it. Within days, we received a check in the mail from the Nelsons–not for the amount that we had requested–but for TWICE AS MUCH! Here was a man of peace who offered without being asked and who was more generous than “required.” He will be remembered by many for golf, but he is known by God for his faithfulness and his generosity! Go out today–and tomorrow–and offer to support someone who needs your help to do the mission of God. Offer without being asked–and watch that missionary’s eyes glisten and voice crack–and know that God is smiling.